The Hurling and Camogie 2018 European season has just begun. 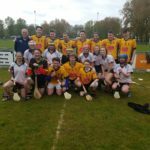 Last year was a successful one as the men (under the colors of Den Haag GAA) finished 3rd and the Ladies (Holland Ladies GAA) 2nd in the European championship, with the highlight of the season occurring in Hamburg where both codes came back with the championship trophies of the tournament. Once again in 2018 both Eindhoven camogers and hurlers will be competing at European level. Courtesy of the partnership with Den Haag GAA and Holland Ladies, you don’t need a second full price membership if you are already a member of the Eindhoven Shamrocks GAA club. Building on last year’s great successes, this season is the opportunity to develop these sports in the region of Eindhoven and to attract new players and members. Whatever you are; a former All-Ireland winner, or just a beginner, you are more than welcome to join us! 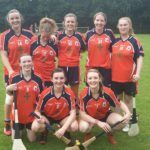 If you are interested in playing Hurling or Camogie and having just generally having a good “craic”, don‘t hesitate to contact us via the website or on Facebook.